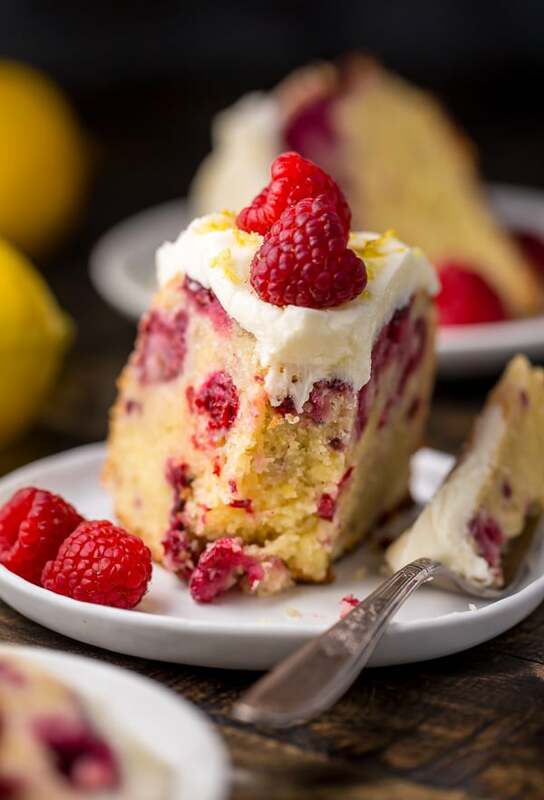 Moist and sunshiny sweet, this Lemon Raspberry Bundt Cake is so perfect for Easter or Mother’s Day brunch! 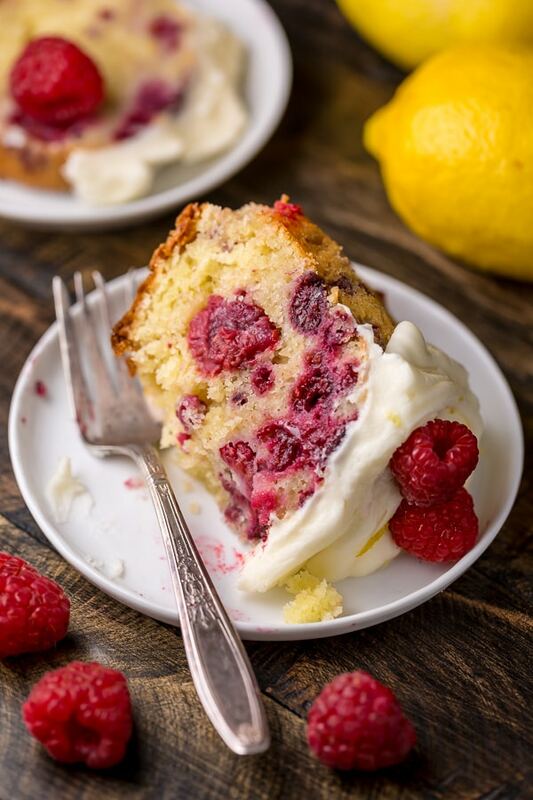 Loaded with fresh lemon zest, lemon juice, and raspberries, this cake is loaded with flavor. Perfect for breakfast, brunch, or dessert! Let’s bake a Raspberry Lemon Bundt Cake! A few weeks ago I asked you what kind of recipes you’d like to see more of, and there was an overwhelming response for LEMON! I get it. I love lemon, too! And with Spring (hopefully) right around the corner, now is the perfect time to add some new lemon recipes to the blog! 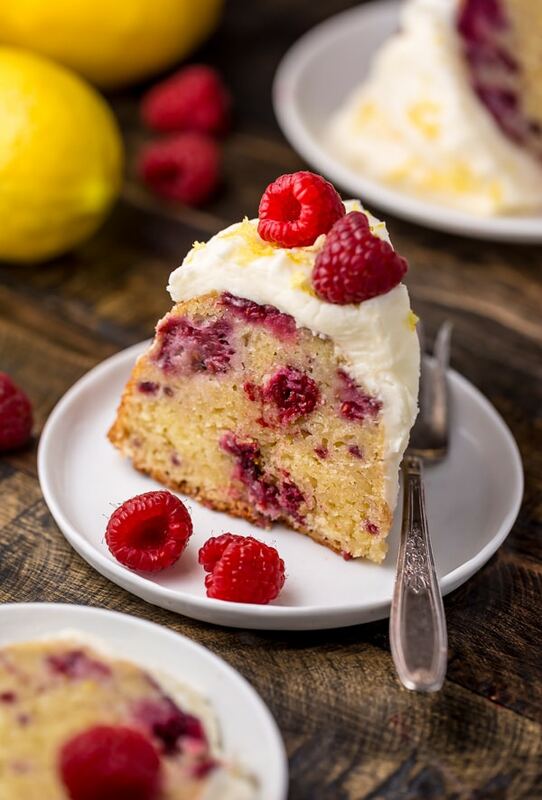 Starting with this moist lemon cake that’s bursting with real lemon flavor and loaded with fresh raspberries. 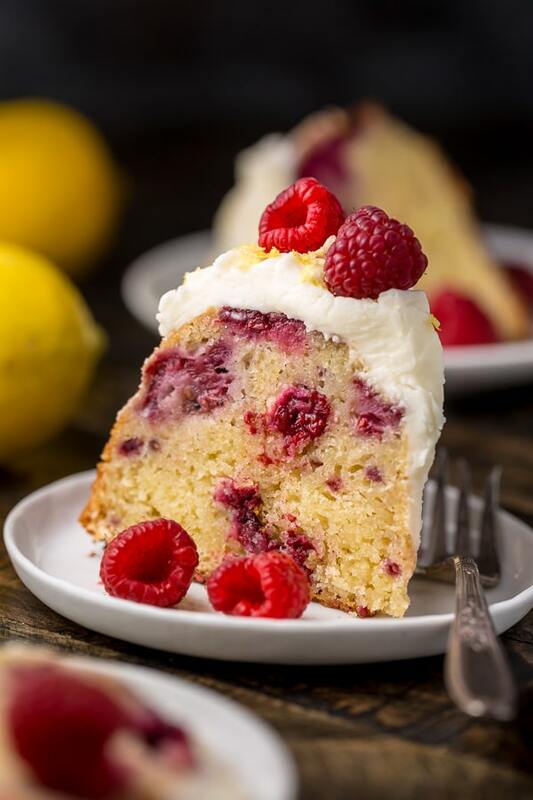 It’s topped with a melt-in-your-mouth lemon cream cheese frosting, and decorated with fresh raspberries and a sprinkle of lemon zest. It’s a total showstopper and SO good with a cup of coffee. 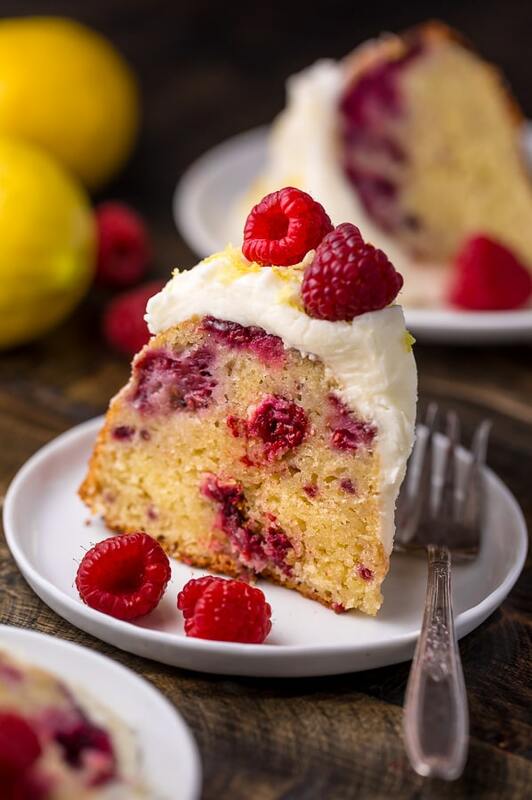 If you love the combination of raspberry and lemon, you have to try this cake! 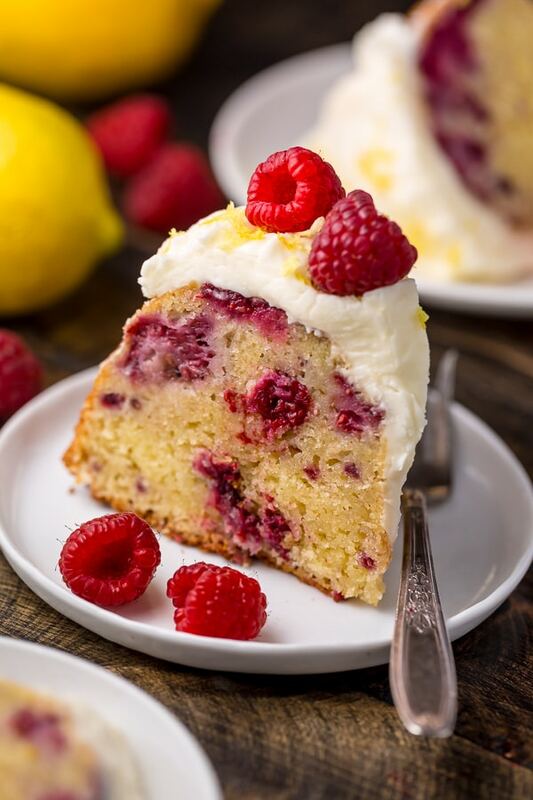 What Ingredients do I need to make Lemon Raspberry Cake in a Bundt Pan? Unsalted Butter: in a pinch, salted butter may be used. But be sure your butter is at room temperature before baking! Full-fat Cream Cheese: I do not suggest using reduced fat here! This ingredient adds moisture and flavor to this cake. Eggs: You will need 5 large eggs for this recipe. Be sure they’ve come to room temperature before you add the eggs to the batter, as cold ingredients do not bond. You’ll also want to add the eggs one at a time, allowing each one to full incorporate before adding the next. Granulated Sugar: I suggest using all granulated sugar, as called for in the recipe. Brown sugar will technically work, but will change the overall taste, texture, and appearance of the cake. So if you do make that change, keep that in mind. Lemon zest, lemon juice, and lemon extract: we use a trio of lemon ingredients to give this cake a real lemon punch. That said, the lemon extract may be omitted. Cake Flour: which gives our cake a delightfully moist crumb. I don’t suggest using all-purpose flour here, but you can use a homemade cake flour substitute. See my notes in the recipe box for more on this. Baking powder and baking soda: the flour, baking powder, and baking soda will be combine to give our cake structure and height. A dash of salt: to balance the flavors and overall sweetness of the cake. And finally, raspberries! Fresh or frozen raspberries will work. But if you’re using frozen, DO NOT THAW THEM! This might be a no-brainer, but you will need a 12-cup bundt cake pan for this recipe. I have not tested this recipe using a different pan – such as a sheet pan or cupcake pan – so I cannot advise on how that would work. You’ll also need a stand mixer or electric hand mixer for this recipe! Unfortunately, the cake batter cannot be made without some kind of electric mixer. If you already have those two items, making this cake is… well, a piece of cake! First step is beat together the butter and cream cheese until light and fluffy. The you’ll add in the sugar, lemon zest, and lemon juice and keep on beating. I like to beat it for about 2 minutes, or until it’s super fluffy and pale. At this point, you’ll want to reduce your mixer speed to low and add in those eggs, one at a time, beating well after each addition. Then you’ll add the flour mixture, and mix on low until JUST combined. Now you’ll mix in the lemon juice. And finally, you’ll turn your mixer off and fold in the raspberries. Be gentle here, as raspberries are delicate little guys, that do break apart easily. Final step, pour the cake batter into a greased bundt pan and bake for 60 to 70 minutes. But if you’re oven runs hot, you might want to start peeking on it around 45 minutes. You’ll want to bake the cake until it’s a deep golden brown and a toothpick inserted in the center comes out clean. Be sure to cool completely before slicing and serving! While the cake cools, you can whip up your cream cheese frosting! And that’s as easy as beating the cream cheese and butter, tossing in the confectioners’ sugar, and then adding in the lemon juice and lemon zest. Just be sure you whip it until it’s nice and fluffy! And finally, if you’d like to decorate your cake like I did, simply top it with some fresh raspberries and a little freshly grated lemon zest. It’s so easy and so impressive! I can’t wait to make this cake for Easter brunch! 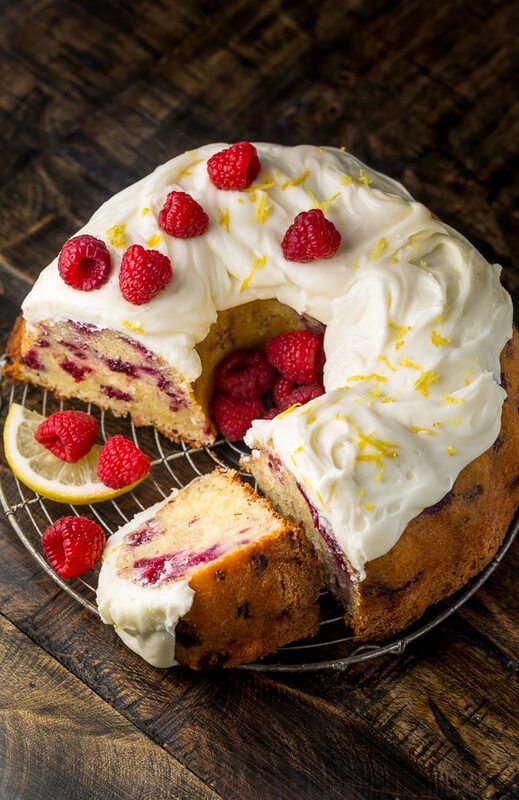 AND IF YOU TRY THIS RECIPE FOR LEMON RASPBERRY BUNDT CAKE, LET ME KNOW! LEAVE A COMMENT BELOW AND DON’T FORGET TO SNAP A PIC AND TAG IT #BAKERBYNATURE ON INSTAGRAM! SEEING YOUR KITCHEN CREATIONS MAKES OUR DAY. Moist and sunshiny sweet, this Lemon Raspberry Bundt Cake is so perfect for Easter or Mother's Day brunch! 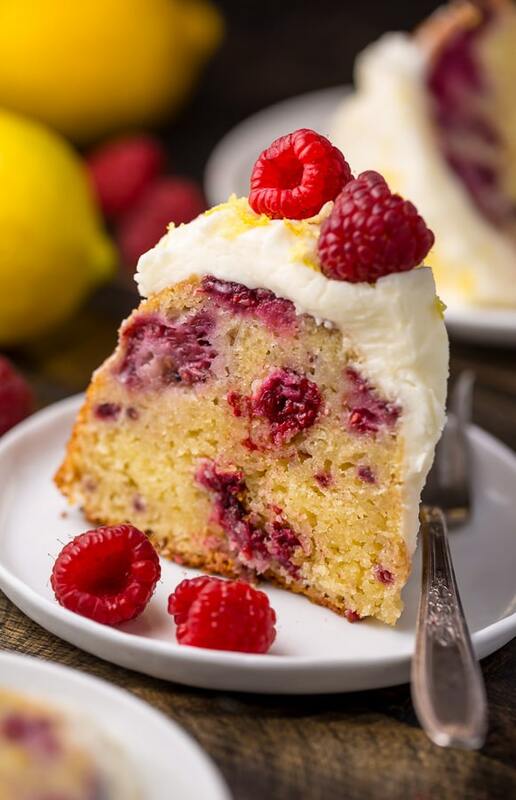 Loaded with fresh lemon zest, lemon juice, and raspberries, this cake is loaded with flavor. Perfect for breakfast, brunch, or dessert! Preheat oven to 325°F (163°C). Generously grease a 10-inch (12-cup) bundt pan, being sure to coat all of the nooks and crannies. I suggest using a non-stick baking spray that has flour in it, or greasing the pan with shortening or butter, then dusting it with flour. Set pan aside until needed. In a medium mixing bowl, whisk together the cake flour, baking powder, baking soda, and salt; whisk well to combine then set aside until needed. In the bowl of a stand mixer fitted with the paddle attachment, or in a large bowl using a handheld electric mixer, beat the butter and cream cheese at medium speed until smooth and creamy, about 1 minute. Gradually add in the sugar, then increase the speed to medium-high and continue beating until light and fluffy, about 3 minutes. Beat in the lemon zest and lemon extract, if using. Reduce the speed back to medium, then add in the eggs, one at a time, beating well after each addition and scraping down the sides of the bowl as needed. Reduce the speed to low and add in the flour mixture, mixing just until combined. Turn mixer off. In a medium mixing bowl, combine the Raspberries and flour and toss well to coat. 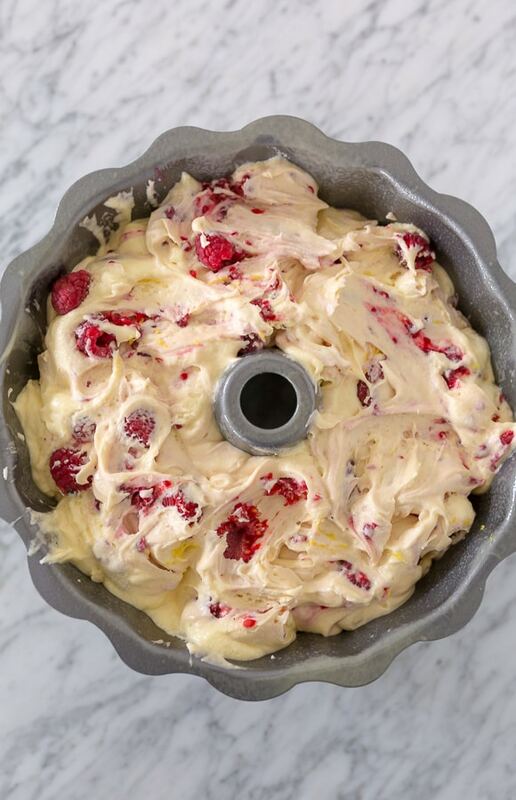 Using a rubber spatula, gently fold the raspberries into the batter until just combined. Bake for 65 to 75 minutes, or until the cake is golden and a toothpick inserted into the center of the cake comes out clean. Allow the cake to cool in the pan, set on a wire rack, for 20 minutes. Then invert the cake onto the rack and cool completely. In the bowl of a stand mixer fitted with the paddle attachment, or in a large bowl using a handheld electric mixer, beat the cream cheese and butter on medium-speed until completely smooth. Reduce the speed to low and gradually add in the confectioners' sugar, beating until all of the sugar is completely combined. Add in the salt, lemon extract, and lemon juice and beat smooth. Once all of the ingredients have been incorporated, increase the speed to medium-high and beat for a minute. Spread frosting on the top and sides of the cooled cake. 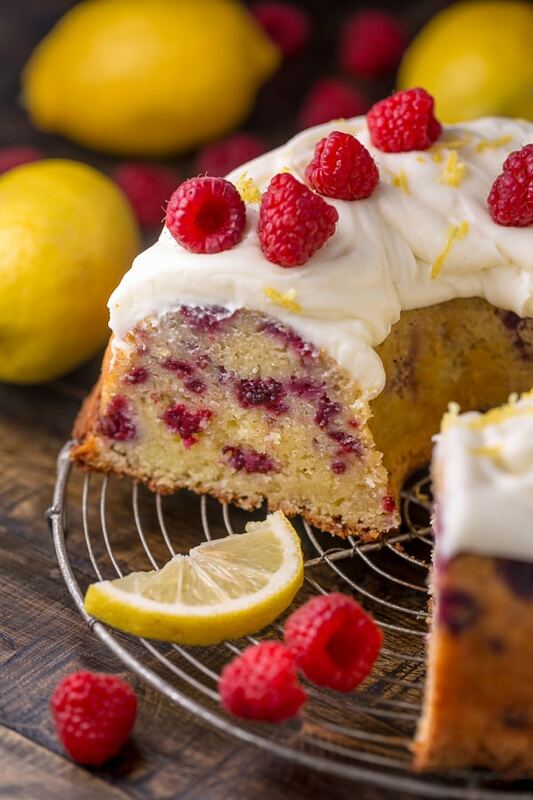 Top with fresh raspberries, lemon slices, and lemon zest. Slice and serve, or store in an airtight container in the fridge, for up to 5 days. Measure out the amount needed for your recipe. For this recipe, you'll need 2 and 1/2 cups. For every 1 cup of flour, remove 2 Tablespoons of flour. Then add in 2 Tablespoons of Cornstarch for every 1 cup of flour. Essentially, you're replacing the tablespoons of flour taken out with cornstarch. Sift the mixture 6 times before using! Always measure the flour that is needed after it has been sifted. I love this recipe. Can I use Strawberry instead of rasberry?